The first anniversary of the assassination of Oliver Ivanovic, a Kosovo Serb politician, was marked in Belgrade on Wednesday evening. According to estimations, tens of thousands of people took part in the protest march demanding the perpetrators and those who have ordered the murder to be found. “We will walk silently and we want an answer to who called for the assassination”, said actor Branislav Trifunovic who has been leading the anti-government demonstrations in the capital since early December. 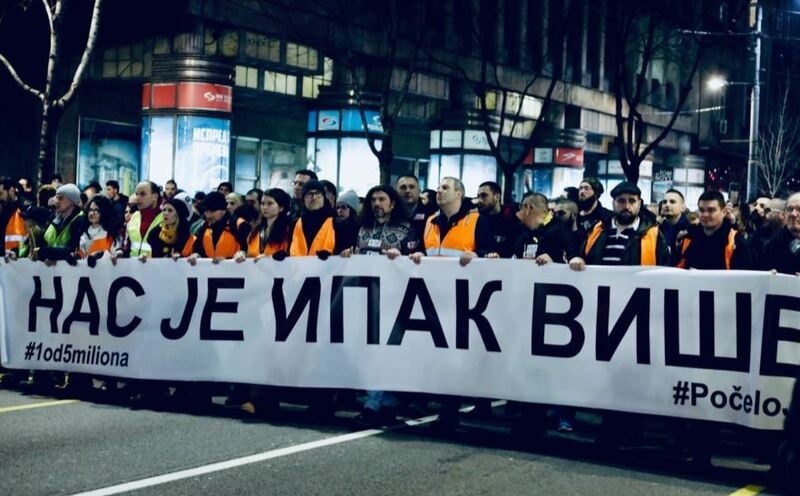 Among those who have taken part in the march were opposition leaders Vuk Jeremic, Borko Stefanovic, Zoran Lutovac, Boris Tadic, as well as former ministers Dusan Petrovic, Dragan Sutanovac and Sasa Radulovic. Some members of Ivanovic family were also present. The march was led by the members of the Local Front, a civic movement from Kraljevo, after Dragan Djilas, one of the leaders of the Alliance for Serbia (SZS) who supports the protests, suggested so. They have, namely, marched from Kraljevo to Belgrade in protest against President Aleksandar Vucic’s rule. For five days they walked 167 kilometers. Earlier on Wednesday, government officials, including Vucic, Prime Minister Ana Brnabic, defence minister Aleksandar Vulin and president of the Office for Kosovo and Metohija Marko Djuric have lit candles in the Saint Sava Cathedral, alongside Ivanovic’s widow Milena Ivanovic. Djuric was pressed by journalists to answer who was responsible for the television spots in which Ivanovic was labeled a thief and a traitor. However, he did not want to answer, directly accusing instead opposition for misusing the tragedy. During the elections in previous years, Djuric had been heavily involved in the campaign in Kosovo elections against Ivanovic. The defamatory spots have also been broadcasted by some publicly financed televisions.